— This article by Jerry Cates, first published on 15 August 2010, was last revised on 17 April 2013. © Bugsinthenews Vol. 11:08(08). All spiders encountered in North American yards, forests, trees, and landscaping make their living preying on insects and other organisms (including, in some cases, small birds and snakes). Most of the insects that spiders prey on are harmful to us, our grasses, shrubs, trees, and gardens. Without spiders, therefore, we would likely be overrun with harmful insects and our lives would be much less enjoyable. Since spiders are such beneficial organisms, it stands to reason that — rather than taking steps to exterminate them — we would, in general, be better served by doing our best to keep them alive, though not so abundant and everpresent as to annoy us, our family members, or visitors to our businesses, homes, and yards. 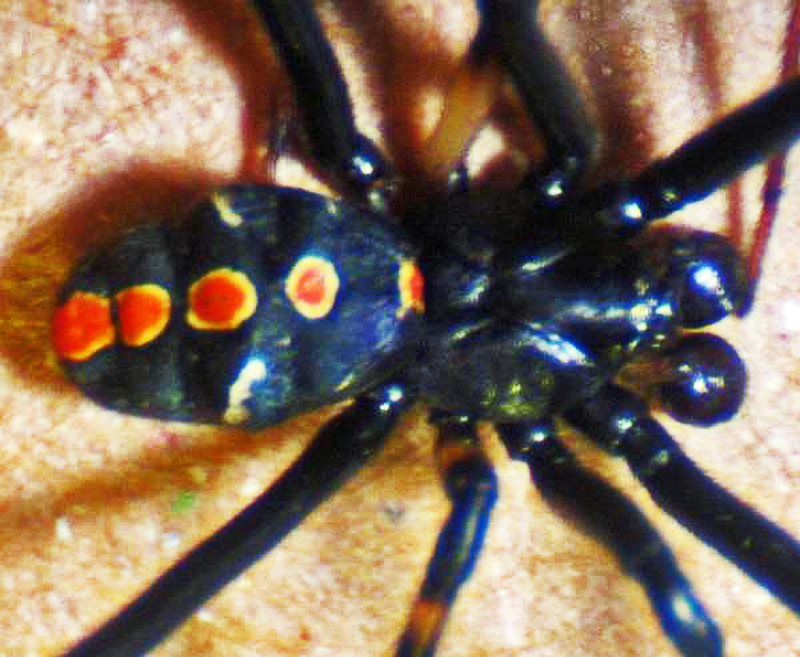 Still, two kinds of spiders — black widows and recluse spiders — pose a clear danger to man (click on the link for information on spider bite first aid) and should be avoided at all costs in or on residential or commercial structures, and in barns used to house livestock such as cows, horses or sheep. Others need to be controlled because their habits make them problematic in other ways. For example, American house spiders (Parasteatoda tepidariorum), and many of their close relatives, though not dangerous to man or our pets, proliferate in the presence of a bountiful supply of small insects and other organisms. In the process, they create messy cob webs that make an otherwise tidy home, barn, or business office appear dirty. Repeatedly removing their webs accounts for countless hours of housekeeping that could be spent in more productive pursuits. Using herb-based habitat modifiers on a regular basis in such areas tends not only to reduce the spider populations, but also reduces the number of small insects and other organisms they prey upon. When we take up the task of spider extermination, the traditional approach is to use pesticides that are labeled for spiders. I strongly recommend AGAINST using pesticides for spider control and extermination, but if you choose to do that (it’s your choice), the options are numerous, as many of our most common pesticides claim to be effective against spiders. Just be sure to follow the label directions. If you are an enlightened individual, willing to use a better-than-pesticides approach to spider control, the method I recommend involves using habitat modification techniques that avoid pesticides altogether. These methods are highly effective at eliminating spiders, without killing them, within homes and businesses, and in reducing their populations in yards and landscaping to acceptable, manageable levels. THE BAD NEWS ABOUT PESTICIDES: Most traditional residual pesticides, in the form of toxic sprays, dusts, or granular baits, are toxic to humans and other organisms, yet are not effective at exterminating spiders unless brought into direct contact with them. Spiders hunt live prey exclusively and often show no interest in dead organisms or inert baits. Further, a spider’s body mass is typically elevated above the surfaces it travels on, so only the tips of each leg–the miniscule tarsus–touches the ground or the spider’s web, where residual pesticides might otherwise intoxicate them. 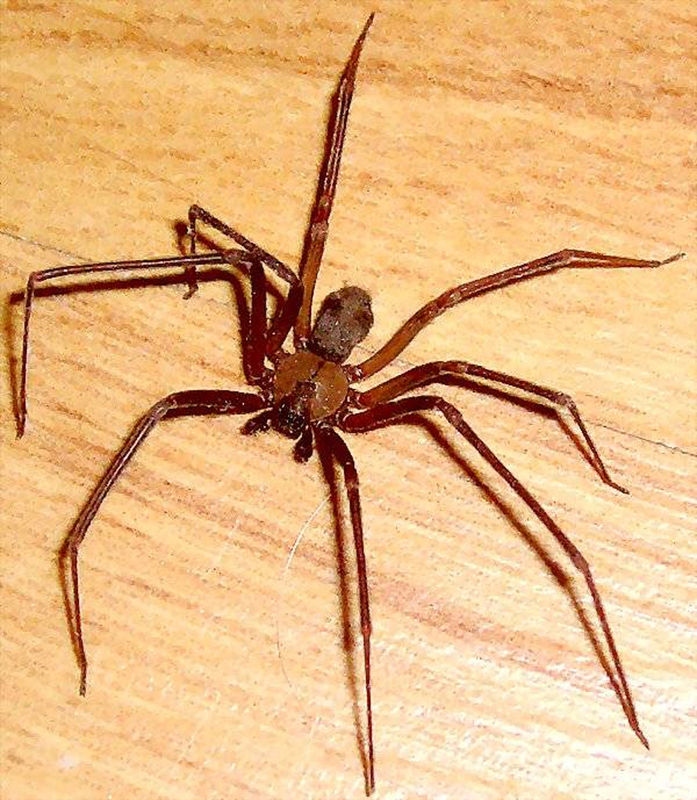 Brown recluse spiders, for example, are widely recognized as difficult to eradicate by using traditional pesticides alone. This is true because (1) only a small fraction of these spiders can be treated directly; the rest are hidden, safe from direct contact with pesticides, most of the time, and (2) residual pesticides are generally ineffective against them, plus there is strong evidence that they have developed, over time, a strong resistance to most pesticides. Similarly, preventing black widow infestations in garages, around and inside homes, and in yards, sheds, dog-houses, and the like, is not generally possible with traditional pesticides. Whenever I’ve used such pesticides in the past to prevent and control brown recluse or black widows in areas where they are endemic, those methods always fail. Later on I find live recluse spiders and black widow spiders in the previously treated areas that have to be exterminated with direct applications of pesticide sprays. Worse, my past attempts to control these spiders with traditional pesticides — even though in full obedience to the instructions on the pesticide label — always resulted in the application of large amounts of toxicant materials, in places where humans, livestock, pets, and other beneficial organisms would come into contact with them. Had those materials actually exterminated the spiders, the risks of toxicant exposure may have made a modicum of sense. But, as pointed out, they didn’t work. That, to me, made such applications doubly worthless. Unfortunately, pesticides do nothing for the cryptic, hidden spiders you cannot see. And in the case of brown recluse and black widow spiders, the hidden ones can sometimes outnumber the visible ones by more than 100-to-1. Obviously, exterminating the visible spiders with pesticides is like putting a small Band-Aid on a gaping wound. Habitat modification techniques, by comparison, allow you to control not only hidden and visible spiders with equal success, but other harmful organisms as well, using entirely non-toxic, non-pesticidal methods. For example, mechanical habitat modifications that use such things as herb-based mulches, carried out to eliminate, seal, and cleanse voids in your home and in the landscaping of your yard, will eliminate cryptic black widow infestations in your home and landscape without having to fire a single shot of pesticide. Inside homes, mechanical habitat modifications to reduce or eliminate clutter, tidying up areas where spiders can hide without being seen in the daytime, is a crucial first step toward correcting an existing black widow or brown recluse spider infestation. Supplementing this with regular herb-based cleansing solutions — which contain natural solvents that are effective at dissolving or weakening spider webs — along with cleaning up and removing debris that accumulates in spider webs, and other clutter that helps to serve as retreats and places for spiders to hide in, significantly improves the effect. Natural cleansers alone, on a regular basis, tends to produce spider-free homes in a matter of weeks. Our parents and grandparents knew that, way back in the past, and that’s how they kept their homes free of pests without using pesticides. Elbow-grease, I believe, was their name for it, but besides the elbow-grease they supplied, there was usually a basin of soapy water in the mix as well. If cedar, mint, eucalyptus, or other natural fragrances are added to the soapy water, all the better. We may think those smells are strictly cosmetic, but in fact they serve important functional purposes, too. They actually clean up smells left behind by animals and spiders that those organisms find attractive and nurturing. By obliterating those odors, they make the cleaned area less attractive to organisms that home in on those smells, so it no longer nurtures them. Spiders go where they are nurtured. They don’t loiter elsewhere very long. The point is, it is not necessary to use repellents. Merely producing an environment that does not nurture or attract spiders is enough. Soap-and-water solutions, mixed up in the kitchen or bathroom sink, are–of course–primarily used to wash up grime and grit left over from the vicissitudes of ordinary life, and are not intended to kill spiders. That is more than just a platitude. It is a fact that, in a non-nurturing environment that does not attract spiders, not only are live spiders seen only rarely, but neither are dead spiders found when the home is searched for them. When sticky trap monitors are placed around a sparkling clean home that has been kept clean this way (and provided that habitat modification techniques are being used in a general way, inside and outside the home), they stop recording the presence of spiders altogether. And, we have observed that when these practices are followed regularly, the home tends to remain practically spider-free, indefinitely. WHAT ABOUT SPIDERS WE DO SEE? What about spiders that can be seen? Ordinary cleansing solutions, again, accomplish interesting, though entirely unintended results. Perhaps you have already noticed than when you aggressively wash down an area where you had been seeing spiders in the past, suddenly those spiders stop being seen there, often for long periods of time. More than likely, the ordinary soap and water solutions you used accomplished more than you realized. Directly applied soap-and-water solutions, used to clean up the areas where spiders reside, often kill the spiders they come into contact with as well as over-the-counter pesticides. Though not intentionally used as anything more than cleansers, they do much more than that, yet they add no toxicants to the air, and leave no residual toxicant matter behind. ———-The spider’s outer skin typically provides for gaseous exchange, and serves as a crude lung. Coating the skin with a soap-and-water solution causes that gas exchange to cease. ———-Spiders have book lungs constructed of stacks of lamellae–plate-like structures like pages in a book–whose surfaces are separated by a thin layer of air; as fresh air is drawn into the lamellae and through the thin spaces between each plate, carbon dioxide is released from–and oxygen is absorbed into–the spider’s blood. When these structures are stuck together by soapy water, the lamellae become useless. ———-Tubular tracheae open to the outside through tiny spiracles, or stigmata. Soap-and-water solutions clog these openings, and respiration through the tracheae ceases. IMPORTANT MECHANICAL HABITAT MODIFICATION TIPS FOR SPIDER CONTROL: You can reduce the need to exterminate spiders anywhere by implementing changes that reduce their numbers naturally. Spiders don’t remain where prey isn’t abundant. Reducing insect populations usually reduces spider populations, often dramatically, in the same locale. Many, if not most, yard spiders are diurnal (day-active) feeders (though recluse spiders, and many orbweavers are nocturnal, i.e., night-active); after the sun goes down insect activity tapers off and many diurnal spiders rest, especially the wandering hunters and jumpers that rely on vision to locate prey. These facts have important implications regarding the best ways to produce an environment with fewer spiders in it. Ordinary outside lighting transmits short wavelength illumination in the blue-ultraviolet spectrum that attracts insects. This, in turn, attracts wandering spiders, such as hunters and jumpers, all night long, because they are nurtured (i.e., fed) in such locations as long as the lights are on. Wolf spider populations, in particular, increase significantly around such lights, where they congregate in the cracks and crevices, such as those around our doors and windows, waiting for a chance to jump an insect that alights nearby. So, what happens the next morning, or during the night, when you open a door or window near such a light? Voila! You unintentionally let some of these inside. Of course you can turn all those outdoor lights off, but that can reduce the security at your home. A better fix to this conundrum is to install bug lighting in all the outside lights that are left on after dark. You can go the expensive route and buy specially-made bug lights. These bulbs are available with traditional incandescent, halogen, fluorescent, and LED elements, but they cost 2-3 times the cost of ordinary bulbs, and often do not last quite as long. To cut costs, you can make bug lights from ordinary bulbs (but don’t do this with any super-hot bulbs, including halogen, mercury-vapor, or sodium-vapor bulbs) by spray-painting the bulbs yellow. I prefer sun yellow or canary yellow pigments, as they are effective at masking out the ultraviolet that attracts bugs. Make sure you get good coverage on all the transparent or translucent glass surfaces of the bulb, but avoid too thick a coat. Be careful with fluorescent bulbs, as breakage releases toxic mercury compounds. Though spiders don’t usually go where they aren’t attracted or nurtured, they often go where they aren’t wanted. For example, most humans don’t want spiders running loose in their homes, even if they might eat a stray bug once in a while. In my home it isn’t too unusual to see a fine specimen of a bold jumping spider (Phidippus audax) on the back door frame, inside the house. I presume she spends as much time outside as inside, and fortunately for her she doesn’t wander too far afield. As a result, my wife lets her be. However, if a wolf spider gets into the house, and starts running around on the floor, all bets are off. Much of my time these days is spent in hospitals, nursing facilities, and medical clinics, inspecting for insects and spiders. Wherever I find an abundance of spiders inside such facilities, the cause is usually obvious. Most often the outside doors have one or more defective seals, and the lower sweep predominates as the culprit. To keep spiders out of your home, make sure your exterior doors are sealed properly. Pay particular attention to the plastic or rubber sweep under the door; even a tiny opening at one side of the sweep will let in a multitude of 8-legged friends. One more note about spider exclusion: sometimes indirect methods work best, and such methods can be carried out at several levels. For example, indirectly controlling other organisms that spiders prey on will automatically lead to the control of spiders as well. But it isn’t necessary to actually “control” either spiders or their prey to achieve good results. All you need to do is wash away the artifacts that signal their presence. Spiders, like all other organisms, follow pheromone trails, or other scents left behind by their prey, and by potential mates. Using a strong essential plant oil cleanser to wash these pheromones and scents off of the door frames, weep holes, window frames, and other locations where prey and spiders congregate will remove the attractants that promote such congregations. NOW THE GOOD NEWS: Common over-the-counter pesticides, such as aerosols, dusts, and fogs labeled for spiders and insects, generally work well when brought into direct contact with spiders. The spider’s outer skin typically provides gaseous exchange for the spider, and serves as a crude lung. Coating the skin with a soap-and-water solution causes that gas exchange to cease. Book lungs have stacks of lamellae–plate-like structures like pages in a book–whose surfaces are separated by a thin layer of air; as fresh air is drawn into the lamellae stack and through the thin spaces between each plate, carbon dioxide is released from–and oxygen is absorbed into–the spider’s blood. Stuck together by soapy water, the lamellae become useless. Tubular tracheae open to the outside through tiny spiracles, or stigmata. Soap-and-water solutions clog these openings, and respiration through the tracheae ceases.